Study Abroad Programs from Edwise International and Know more about -The Right Educational Advisor - Edwise. Edwise International helps you to take admission in best Colleges or University in Abroad for Studies. Our consultants will help/guide you to apply for admission to Study Abroad. Know Tips for International students to study abroad with the help of with the help of Edwise International Read our blog / Articles for latest updates and news and to know information about Abroad Studies. Enquire now 18002003678 for more details and Information. Since its existence in 1991, Edwise has been constantly providing quality and professional guidance to all its students. Our core activity lies in assisting students make the right choice in their decision to study abroad. Edwise is the one stop solution for all your international study needs and provides information on higher education in UK, USA, Canada, Australia, New Zealand, Singapore, Ireland, Switzerland, France, Malaysia and Dubai with a strong command over the education system worldwide. Edwise, a pioneer in the field of 'GLOBAL EDUCATION' has brought the notion of studying abroad to the doorstep of every student, making it affordable and devoid of cumbersome procedures. Our excellent network with Universities helps us deliver our best services to our students. A solution-oriented company, with a single minded approach, Edwise helps tailor career paths to suit individual profiles within parameters that may prevail in each case. Additionally, our wholly owned national network of counseling & training centres are accessible to students throughout India. Many of our counselors here at Edwise have also worked and studied abroad. Further our counselors travel abroad and have been trained by international experts to guide students select the right course at the ideal university.
.	University Selection- The counselors at Edwise are an experienced team of professionals that are here to make this process an easy one. The wealth of knowledge that our counselors possess enables them to map out the right university for you after carefully reviewing your profile.
. Exams and Coaching- Coaching at Edwise offers personalized test prep based on adaptive learning. We also allow for flexibility of batches in all 23 locations across India.
.	Financial Assistance- Our tie-ups with well-established private banks and financial institutes offer educational loans to students at reasonable rates. We also help with selection of banks and assist in the application process right from the required paperwork to the eligibility criteria.
. Recommendation & Scholarship Guidance- We offer our services by sending recommendations to universities on why you should be granted admission. Furthermore, we also provide guidance on the types of scholarship along with the necessary guidelines of these universities.
.	Travel & Forex Assistance- Our counselors here at Edwise will help you choose an airline that offers cheaper fares and excess baggage schemes. We are well connected with forex dealers and ensure that our students get good exchange rates. Additionally, we also help you with demand drafts, traveller's cheques, international debit cards, wire transfers and currency notes.
.	Pre-departure Guidance- The pre-departure seminar by Edwise provides students with information on the various facets of student life prior to landing in their host country. This seminar is an opportunity for you to meet other students and parents headed to the same country.
.	Visa Assistance- Edwise offers free visa guidance to all its students and assists in filling up application forms, preparing financial statements and conducting mock interviews. We are constantly updated on the latest visa requirements and have a success rate of over 99%.
. Academic Pathway Planning- Very often students face a dilemma when choosing the road to a higher education. The Academic Pathway Planning Program is designed to make students aware of their interests and recognize their potential..
"Edwise exhibitions gave me overview of all countries and universities. When I chose my country and the university edwise guided and helped me very well from applying to getting visa. I am extremely grateful to Edwise." Edwise guided me from my IELTS preparation, to my university selection, my SOP's, my offer letters and much more.There was nothing to worry about, the counsellors keep in touch with you, follow up regularly, and guide you to whats the best for you. All in all they make it a hassle free experience. A roller coaster ride but eventually thrilled that I got the college of my choice. My counselor played an important role in this and definitely Edwise for guidance throughout. I was happy with the suggestions & assistance provided by the members of the organization. The process was definitely shortened and handled with ease because of the above mentioned point. Cheers! It's one of the Best and Recognised Consultancy where you find friendly environment to clarify all your queries. 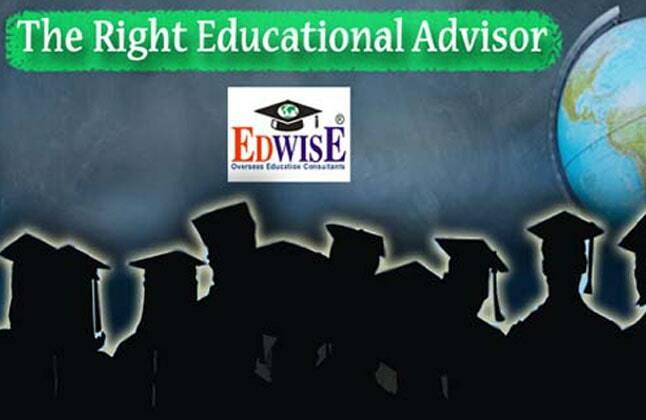 As per me Edwise International is the best consultancy where you find one of the best guidance for your perfect future, they also help you for arranging all necessary preparation. Great Experience! i am very happy with the Entire Service of Edwise.They have a bunch of great Team Who helped me step by step to complete my entire procedure in an easy manner. Great Team! Great Job! We at Edwise streamline and personalize the process for each student irrespective of the destination, institution, course or any level of study. Our team of experienced professionals will provide you individual attention and exceptional guidance throughout your process of application. We provide assistance related to course selections, admission, visa, bank-loan and scholarships. We also host University delegates for direct student interaction and all these services are provided free of cost. We have established since 1991 and have been maintaining strong networks with over 575 universities in 16 countries, hence giving us a unique insight into the finest educational establishments worldwide. Start your education overseas with valuable information on everything you need to know about studying abroad from study permits, temporary resident visas and how much it costs, to finding a program. 1-800-200-3678 (Toll Free) / 08600911333.